Fukuoka Prefectur (福岡県, Fukuoka-ken) is a prefectur o Japan locatit on Kyushu Island. The caipital is the ceety o Fukuoka. 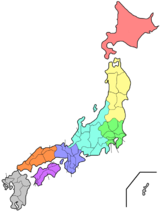 Fukuoka Prefecture includes the umwhile provinces of Chikugo, Chikuzen, an Buzen. Fukuoka Prefectur faces the sea on three sides, borderin on Saga, Ōita, an Kumamoto prefecturs an facin Yamaguchi Prefectur athort the Kanmon Straits. Fukuoka includes the twa lairgest ceeties on Kyūshū, Fukuoka an Kitakyushu, an much o Kyūshū's industrie. It includes a nummer o smaw islands near the north coast o Kyūshū. Thir are the touns an veelages in each destrict. Fukuoka prefectur's main ceeties form ane o Japan's main industrial centres, accoontin for nearly 40% o the economie o Kyūshū. Major industries include automobiles, semiconductors, an steel. Fukuoka prefectur is notewirthy as the place whaur tire manufacturer Bridgestone an consumer electronics chain Best Denki wur foondit. Fukuoka Art Museum – In Ohori Pairk; contains a wide selection o contemporar an ither airt frae aroond the warld. Fukuoka Asian Art Museum – contains airt frae various kintras o Asie. Fukuoka City Museum – displays a broad range o items frae the region's history, includin a spectacular gowd seal. Genko Historical Museum (元寇史料館; Museum o the Mongol Invasion) – In Higashi Koen (East Park); displays Japanese an Mongolie airms an armour frae the 13t century as well as paintins on historical subjects. Open on weekends. Hakata Machiya Folk Museum – Dedicatit tae displayin the tradeetional weys o life, speech, an cultur o the Fukuoka region. Fukuoka Masjid Al Nour Islamic Cultur Center, Dedicatit tae share Islamic subjects an cultur. The sports teams leetit belaw are based in Fukuoka. The prefectur haes twa significant annual athletics events: the Fukuoka International Cross Country an the Fukuoka International Open Marathon Championship. The marathon race haes been held in Fukuoka syne 1959 an haes seen a nummer o warld records breuken durin its history. Fukuoka Prefectur haes the lairgest nummer o designatit yakuza groups amang aw o the prefecturs, at 5; the Kudo-kai, the Taishu-kai, the Fukuhaku-kai, the Dojin-kai an the Kyushu Seido-kai. Atween 2004 an 2009, an in early 2011, Fukuoka Prefectur leads the naition in gun-relatit incidents. Thir incidents wur maistly relatit tae the local yakuza syndicates, specifically the Kudo-kai, the Dojin-kai an the Kyushu Seido-kai. Fukuoka Prefectur haes haed the heichest frequency o youth creeme amang aw o the prefecturs o Japan syne 2003. The maist popular place for tourism is Fukuoka Ceety, especially at the time o the Dontaku festival, an Dazaifu, awtho Kitakyūshū haes tree'd tae attract tourists an aw. ↑ Nussbaum, Louis-Frédéric. (2005). "Fukuoka-ken" in Japan Encyclopedia, p. 218 at Google Books. ↑ Nussbaum, "Fukuoka" in p. 218 at Google Books. ↑ Nussbaum, "Provinces and prefectures" in p. 780 at Google Books. ↑ "Nationwide List of Ichinomiya," p. 3; retrieved 2012-10-26. ↑ Nakamura, Ken. Marathon - A history of the Fukuoka International Marathon Championships by K. Ken Nakamura - Part 1 1947-1966. IAAF. Retrieved on 2010-02-28. Wikimedia Commons haes media relatit tae Fukuoka Prefectur.